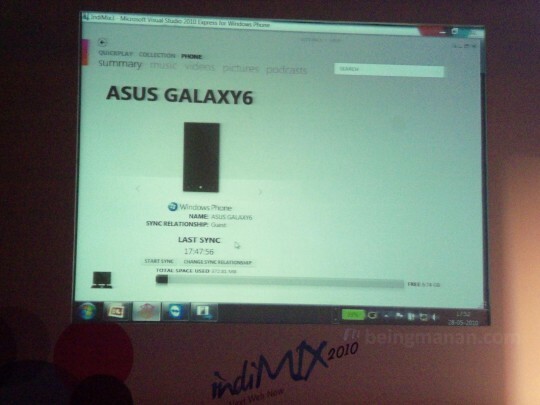 A friend of mine Manan, managed to get a sneak peak at an internal build of Zune Desktop software which is capable of syncing with Windows Phone 7 series devices – in this case, an ASUS Galaxy6. The current version of Zune desktop software (version 4.2) doesn’t sync with Windows Phones, though select individuals who have access to Windows Phone 7 devices also have a pre-release build of Zune software which works with these devices. According to Manan, during an IndiMIX 2010 demo of Windows Phone 7 application development, the Asus Galaxy6 ran into some technical trouble with Visual Studio 2010. The speaker had to reconfigure the device syncing through Zune desktop software. When connected, a new Phone pivot appears next to Collection, with four sub-tabs, Summary, Music, Pictures, Videos and Podcasts. 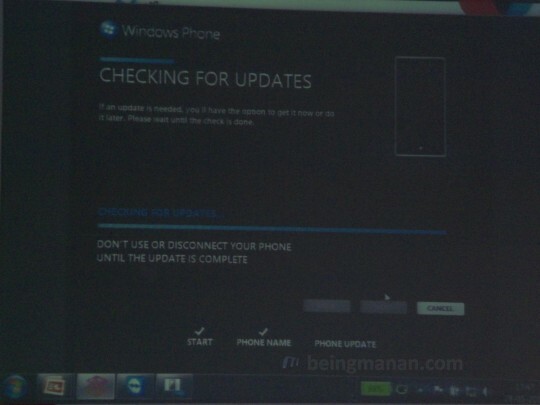 The previously announced Windows Phone OS update screen was also shown. Interestingly, it appears that the Windows Phone OS 7 devices would only be able to sync photos, music, videos and podcasts with the Zune desktop software. There is no apparent way to manage and organize applications Â on the device like iTunes does for the iPhone OS. I really hope Microsoft do decide to bake App management features in the Zune desktop software before the release of Windows Phone 7. Head on over to Manan’s blog for a few more screenshots. Ran 15 queries in 0.143 seconds.